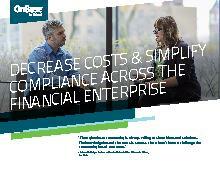 Many financial companies are decreasing costs dramatically with ECM, commonly called document management. In fact, Principal Global Investors saves more than $1.6 million annually by electronically capturing more than 1,000 types of documents and managing them in OnBase. Why choose OnBase for your document management solution?